The Institute of Kitchen, Bedroom & Bathroom Installers is delighted to announce a new training initiative for its members relating to life saving asbestos awareness specifically for kitchen, bedroom and bathroom installers. 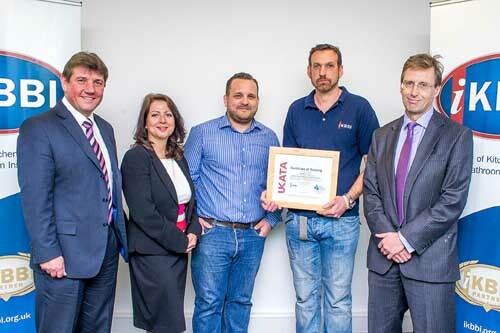 Working with the Hertfordshire based training provider Asbestos Training Limited, the iKBBI have commissioned a bespoke online course specifically aimed at installers of kitchens & bathrooms. The simple online course is a bolt on module to their Asbestos Awareness e-learning programme which has been uniquely tailored to KBB installers and will result in an industry recognised qualification from UKATA (United Kingdom Asbestos Training Association) and the certification of Asbestos Awareness training. Speaking on behalf of the training provider Asbestos Training Limited, Jacqui Royall, Training Manager said: “Our online Asbestos Awareness course is incredibly straight forward and has already been used by tens of thousands of people in the work place from the self employed worker through to very large organisations to ensure that they are fully aware of the risks as well as being compliant with current regulations”. Jacqui continued by saying: “This e-learning course will provide the all-important awareness that satisfies the legal requirement for tradespeople likely to come across asbestos during their course of their work, and what to do should that happen. We’re delighted to have created an additional, bolt on element, which is KBB specific and are proud to be associated with the iKBBI. We are very keen to support the institute’s work and look forward to long and successful relationship as a supply chain partner”. iKBBI Director of Operations Claire Walters commented on the new relationship by saying: “We’re pleased to be working with the leading training provider on such an important topic. Asbestos related disease is responsible for thousands of deaths in the UK each year, so awareness in this area is absolutely vital for our members and the communities they serve”. iKBBI Patron Stephen Metcalfe MP (pictured) commented on the initiative by saying: “Asbestos awareness is clearly an important subject, as is the health and wellbeing of tradespeople and their customers. The iKBBI has worked hard with the training provider to deliver a simple, yet highly effective solution that is relevant to the institute’s industry – a UK first I believe”. The iKBBI is also working with their sponsors at UK Special Risks – the specialist insurance provider for the KBB industry. Also pictured, MD Martin Bell commented by saying: “Asbestos awareness is essential as is insurance protection. We’ve been working with the iKBBI, a selection of their retail partners and members with policies that provide maximum protection. Most insurance cover does not include this asbestos element of protection, but our tailor made policies do. Our policies will compliment the awareness training by providing important cover should asbestos be discovered whilst on site”. For more information on the initiative visit: www.ikbbi.org.uk or call 0845 519 2007 for further information.